When I was young I was equally fascinated watching Julia Child as much as Sesame Street on PBS. It was the beginning of my fascination with cooking in the French style. If you have ever prepared any of Julia Child’s recipes you will see 2 common ingredients: lardons (fatty bacon) and butter. She also lived to be 91 so I have no comment about the health implications of such a diet. But many of us can only consume so much butter and pork fat on a day-to-day basis. This post is not about the health benefits of cooking with one fat verses another. 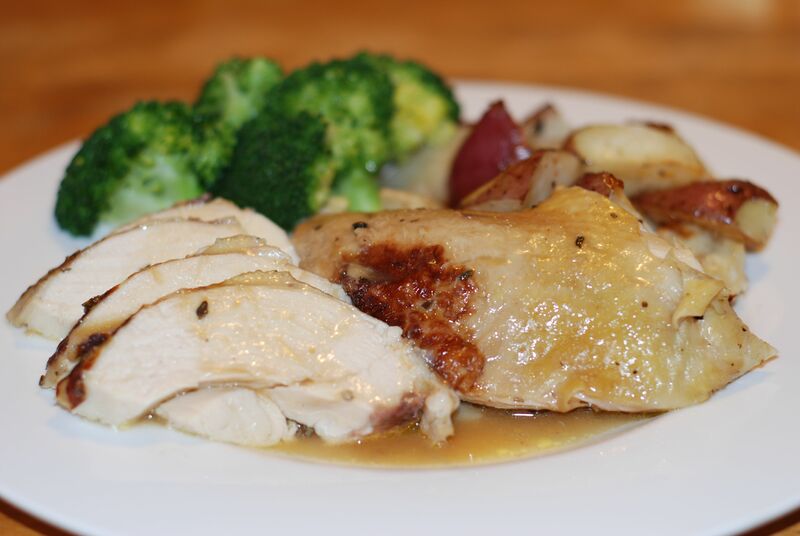 It is simply an experiment to compare the culinary results of using butter versus olive oil to prepare a casserole-roasted chicken. A chicken cooked in this fashion is tender and succulent, with a delicate aromatic flavor, but sometimes you just want an alternative to using a stick of butter. Putting aside flavor, a significant difference between cooking with butter versus olive oil is the smoking temperature. This is the temperature at which the cooking oil will break down and produce an acrid smoke. For butter, that temperature is 300 degrees, where as olive oil has a much higher threshold of 375 degrees. What this signifies is that butter, while less tolerant to high heat, will also brown what you are cooking more quickly. The following photo is an example of the browning results between the two oils. Left: Chicken seared in butter Right: Chicken seared in olive oil. 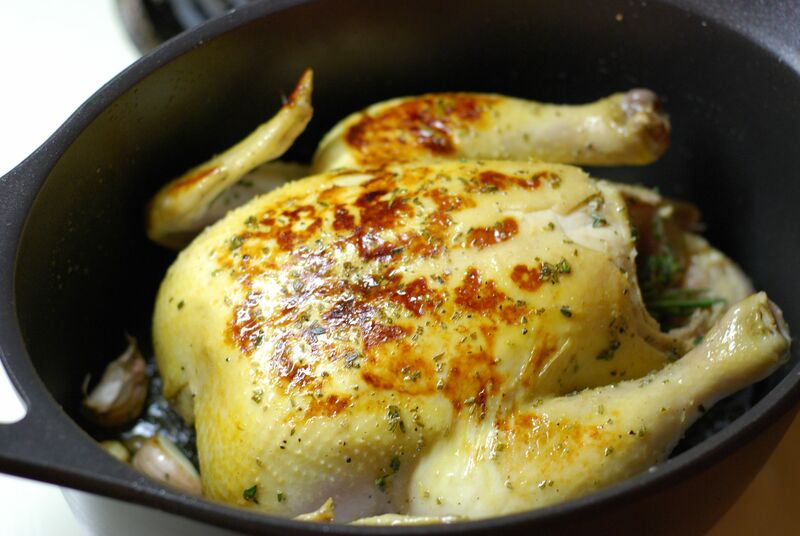 As for the flavor and consistency of preparing the chicken in butter versus olive oil, both chickens came out equally tender and succulent but obviously projected the unique flavor attributes of the cooking fat. 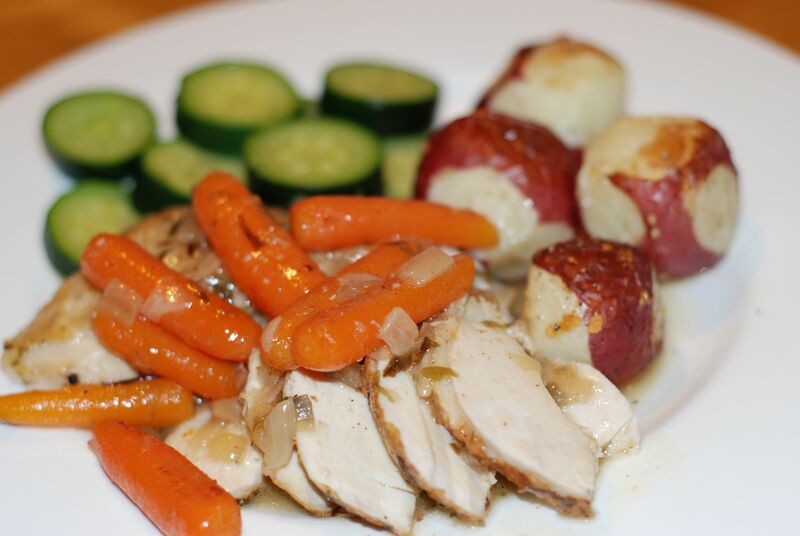 The chicken roasted with butter has a rich, almost creamy-smooth texture and flavor. The olive oil roasted chicken also has a rich quality and smooth texture but not the same creaminess as the butter roasted chicken. This recipe is inspired by Julia Child’s Poulet Poêle À L’Estragon. (Sorry Julia, I do not truss my chicken for my Tarragon Chicken recipe). I have followed her recipe exactly and I do admit that the breast meat of the chicken is a bit juicier when the bird is trussed. Also, if you would like to serve your chicken intact you will need to truss the bird and increase the cooking time in this recipe by approximately 10 minutes. If you do not truss the chicken, as I do in this recipe, the legs will fall loose when you pick it up out of the pan. I prefer to carve the bird prior to serving so it’s not important to me to have the bird in one piece. For personal taste I add garlic and increased the vegetables used in this recipe. Brush 2 tablespoons melted butter on the outside and inside of the chicken. Then sprinkle the tarragon, salt and pepper on the outside and inside of the chicken. Preheat oven to 325°. 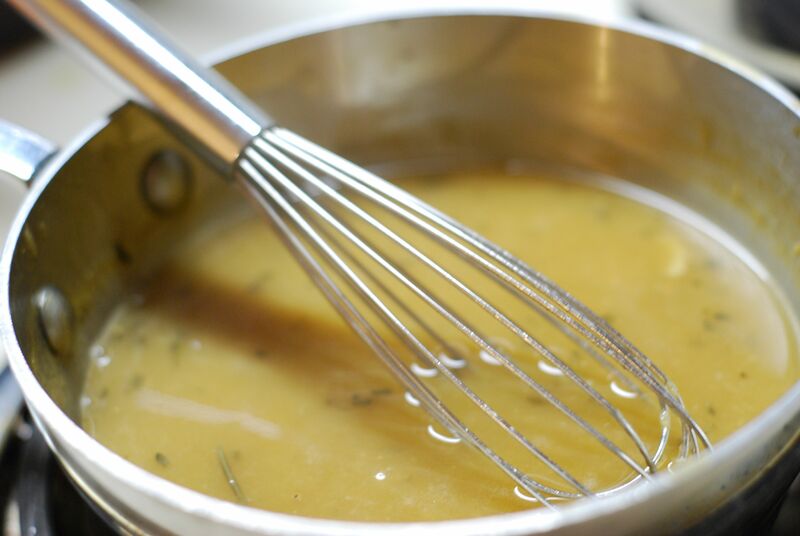 Melt 2 tablespoons butter and vegetable oil in a Dutch Oven or heavy stove-to-oven-safe pan. Brown the chicken on all sides, starting with the breast side first. Remove chicken to a platter. In the same pan, sauté onions, carrots, garlic, and ½ teaspoon tarragon for 3-5 minutes. Return the chicken to the pan, breast side up. Using a bulb baster, baste the chicken with the liquid in the pan, squirting juice into the chicken cavity as a last step. 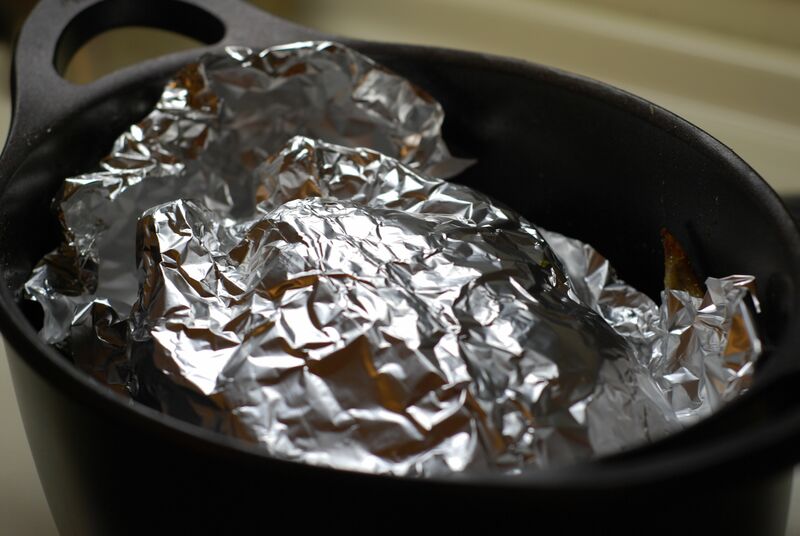 Cover chicken with a piece of aluminum foil, then cover with the pan lid. Bake 35 minutes for a 3 lb chicken, 45 minutes for a 5 lb chicken. The chicken is done when the drumstick moves in their sockets. NOTE: The length of time to cook will vary based on the type of pan or dish you are using. The time I recommend is based on using a heavy non-stick cast iron pan. Julia Child recommends 1 hour 10 minutes for a chicken weighing 3 lb and 1 hour 30 minutes for a 5 pounder, which I found to be too long. Her lengthier time is probably due to her chicken being trussed and the recipe was written in 1961, when it was more common to cook poultry well-done. SERVING RECOMMENDATIONS: Carve chicken per your own preference and pour sauce and vegetables over chicken. This recipe is great with roasted or mashed potatoes or rice pilaf. For those of you who are like me and like to have an old fashion printed copy of recipes, the below link is to a PDF (minus photos to keep it on one page). This recipe is prepared identically to my recipe for Casserole-Roasted Chicken with Tarragon, which was inspired by Julia Child’s Poulet Poêle À L’Estragon. But I wanted to experiment using olive oil instead of butter, which compelled me to use Mediterranean herbs. Squeeze out the juice of half a lemon into a small bowl and set aside. Rub the chicken skin and inside of the cavity with the remaining lemon skin/rind. In the bowl of lemon juice, add honey, sherry and 2 tablespoons olive oil. Brush the mixture outside and inside of the chicken. 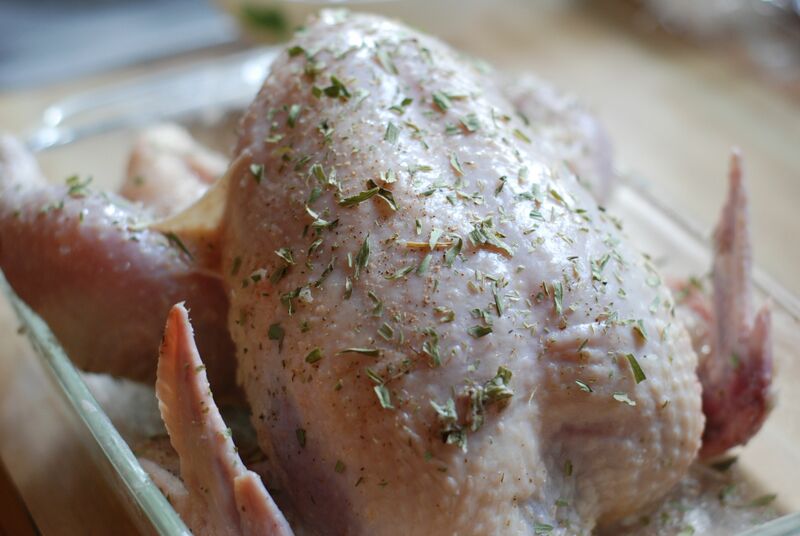 Sprinkle the rosemary, thyme, salt, and pepper outside and inside of the chicken. Preheat oven to 325°. Heat 3 tablespoons olive oil in a Dutch Oven or heavy stove-to-oven-safe pan. Brown the chicken on all sides, starting with the breast side first. Add garlic. Cover chicken with a piece of aluminum foil, then cover with pan lid. Bake – 35 minutes for a 3 pound chicken, 45 minutes for a 5 pound chicken. The chicken is done when the drumstick moves in their sockets. Remove chicken to a platter. Skim off excess oil in pan. 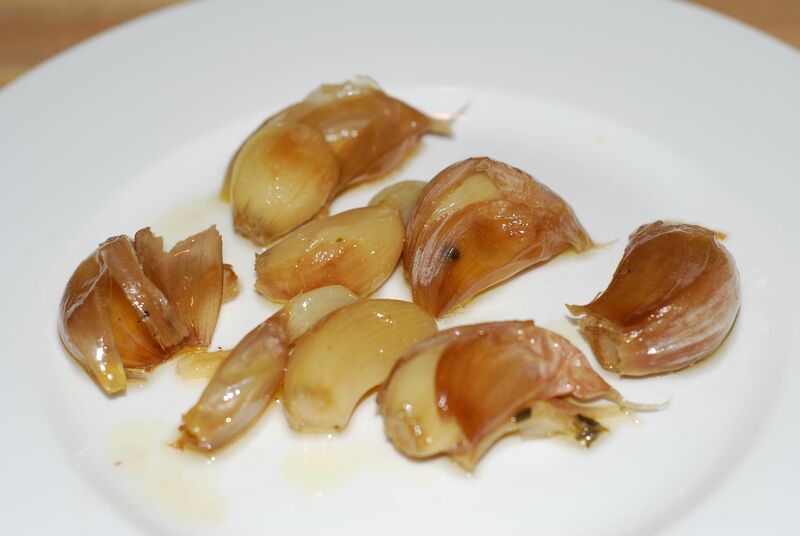 Remove garlic to a small plate. 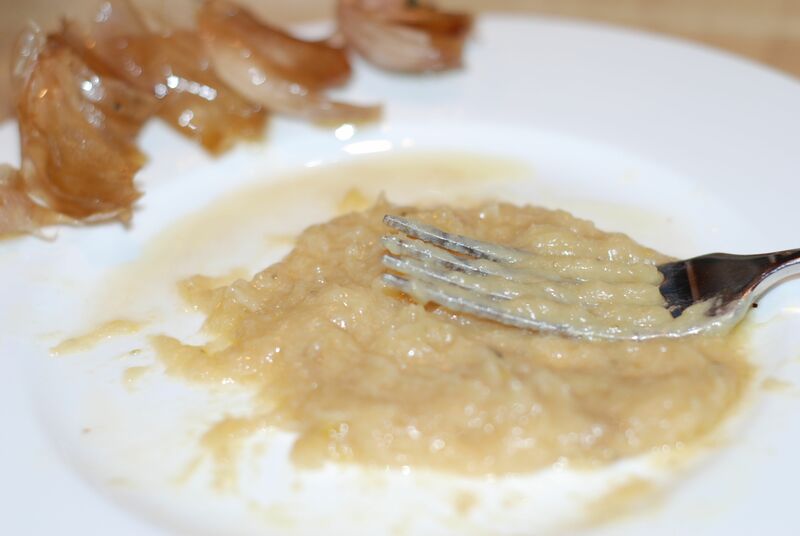 Remove the garlic skins and using the tines of a fork, mash garlic into a paste. Return garlic paste to the pan and stir into juices. Add chicken broth to pan and bring the mixture to a boil on the stovetop. Combine cornstarch and Sherry in a small bowl. Stir cornstarch mixture into pan, mixing well to prevent lumpiness. 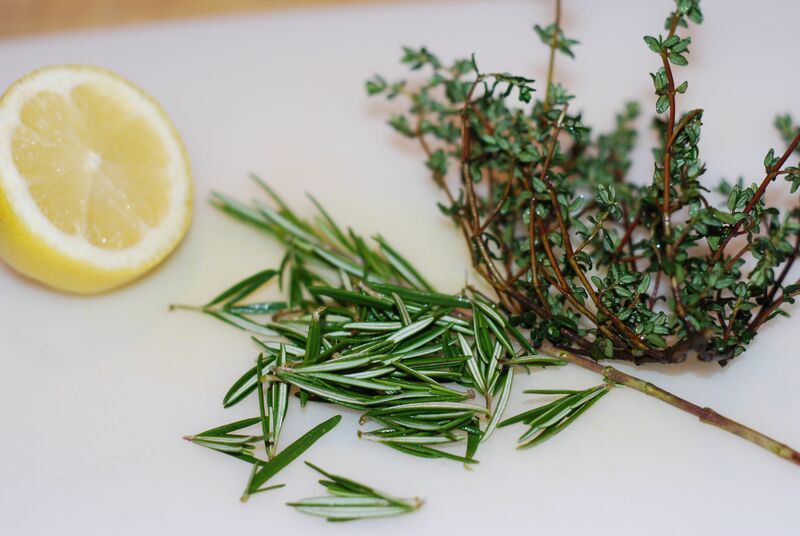 Add a pinch of fresh rosemary and thyme to sauce. SERVING RECOMMENDATIONS: Carve chicken per your own preference and pour sauce over chicken. This recipe is great with roasted or mashed potatoes, egg noodles, or rice pilaf. * Gluten allergy and intolerance has become increasingly common. I will not go into detail about the specific symptoms, causes, or differences but I will note beside the recipe titles “(GF)” for those recipes that are gluten free. Please note that although I have labeled these recipes to be gluten free you must do diligence to review ingredient labels of prepared products to verify that they are truly gluten free. Also consider the side you choose to serve. In some recipes I recommend pasta or bread, which in most cases are not gluten free. Can I move in to be a taste tester? 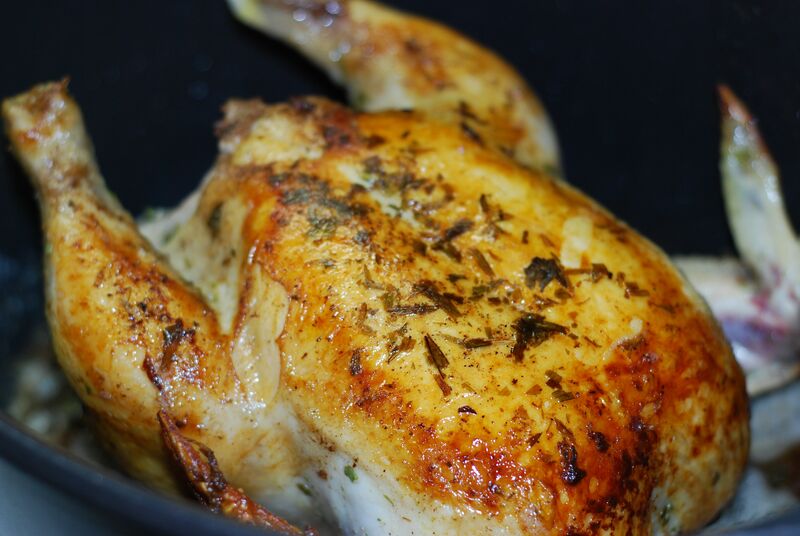 You are currently reading Casserole-Roasted Chicken with Tarragon (GF) and Casserole-Roasted Chicken with Lemon Rosemary and Thyme at Hestina's Kardia.